LAS VEGAS (AP) — Allonzo Trier scored 22 points, Dusan Ristic had 15 points and 11 rebounds, and No. 15 Arizona used a big second-half run to roll over Colorado 83-67 on Thursday in the Pac-12 quarterfinals. Arizona (25-7) wasn’t exactly crisp on offense and Pac-12 player of the year Deandre Ayton had a rare quiet day. The Wildcats made up for it with scrappiness, earning a spot in the semifinals Friday against the Stanford- and UCLA winner. Colorado (17-15) managed to hang with the Wildcats well into the second half despite play a tough opening-round game the day before. The Buffaloes suffered a huge blow with about 13 minutes left, when point guard McKinley Wright IV went down with a right ankle injury. Arizona reeled off 14 straight points and the Buffaloes never recovered. Coach Sean Miller’s job appeared to be in jeopardy late in the season, when an ESPN report alleged he was caught on an FBI wiretap discussing a $100,000 payment to lure Ayton to the school. Miller missed one game and three practices while the school investigated, but returned for the final two games after vehemently denying the report and the university president saying he will remain as coach. Colorado used a big second-half run to beat Arizona State 97-85 in its Pac-12 opener, a game that put coach Tad Boyle in a walking boot after injuring his right calf trying to break up a fight. The Wildcats turned up the defensive pressure and that got their offense going — not to mention the pro-Arizona crowd — for a 15-2 run that put them up 27-19. 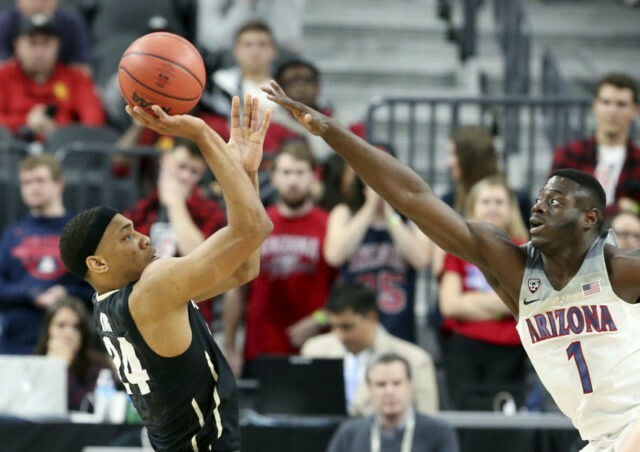 The Buffaloes had a hard time getting into their offense without the freshman leader and Arizona took advantage, going on a 14-0 run to push the lead to 58-41. Colorado could end up in a smaller postseason tournament.